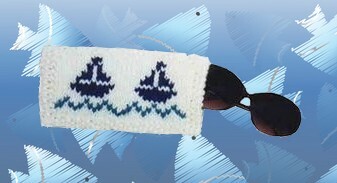 Here’s a free knitting pattern with a nautical sailing ship theme that is suitable for a Father’s day gift or for anyone who enjoys boats or sailing. The eyeglass case pattern is worked sideways and works up quickly in worsted weight yarn. Materials: Worsted Weight Yarn, about 2 ounces of main color, about 4 yards of color “A” for waves, and about 12 yards of color “B” for boats. One pair U.S. # 8 needles. Gauge: Approximately 9 sts. To 2 inches, and 5 rows to 1 inch. With main color, cast on 32 sts. Work in seed stitch, (K1, P1) across row, on return row, P over the K sts., and K over the P sts. Across, for 3 rows. Next row, work seed st. over first 3 sts., P across to last 3 sts., then work seed st. over these sts. Start Graph: Keeping seed sts. on the first 3 and last 3 sts. of each row, work graph in stockinette st. (K1 row, P1 row), repeating graph twice. Continue to finish rows of graph. Now work in main color only keeping first 3 and last 3 sts. In seed st. while working 2 more rows in stockinette on center sts. Now work entire row in seed st. until total length from beginning of work is about 7½ inches. Bind off. Weave yarn ends to wrong side of work and fasten off. Sew side and bottom seam. Makes a nice eyeglass case for either men or women.